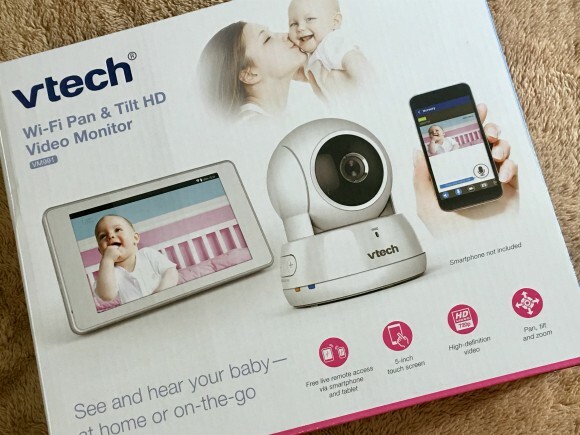 Stacy Tilton Reviews: The VTech Video Monitor - offering peace of mind from anywhere! The VTech Video Monitor - offering peace of mind from anywhere! There are always those days when you can't be home in time to greet your kids when they get home from school. And it's those days for some of us that end up being a little more stressful. Even though my daughter is in middle school now I still worry about her being home alone after school, even for a short time. Not so much that I think she will do anything wrong, just that if something were to happen I'm not there for her. And as a stay-at-home mom that's a big deal to me. So that's why we've taken a few extra precautions to help alleviate that stress for those days it can't be avoided. One thing we've done is installed a camera that alerts my phone of activity outside of our house. This lets me know when she's home, or if anyone else comes up our driveway. And we also have a camera inside the house too. This lets me have the peace of mind that she not only got home safe, but also go inside safe. Right now we are using the VTech VM991 video monitor right in our living room. It's where the main house door leads into so as soon as she walks through the door it alerts me of activity right on my phone. From there I can also talk to her to say hello and let her know when I will be getting home. She can also talk back to me and let me know how her day was which is pretty awesome. Sometimes if I am driving we will just chat until I get home. I like both the video and audio feature because she can be sitting on the couch doing her homework and I can see and hear that she's safe. This particular unit also comes with a 5" touch screen which is nice because it gives you another way to see/hear what's going on in a room without having to even use your phone. This is nice for those times you want to just peek in and see how things are going from another room in the house. This monitor is truly more than your standard baby-style monitor for sure. It's great for all ages, and for all people with or without kids. Equipped with free remote access and motion alerts, the VTech VM991 video monitor lets parents know as soon as their kids return home from school. Two-way talk eliminates the need to call or text, while pan and tilt enables parents to have a complete view of the room. The high-definition video allows mom and dad to see clearly and 10x zoom captures all the small details to ensure little ones are safe and sound.